The vote, which is scheduled for today (April 11) comes as firefighters work to extinguish a wildfire that consumed about 1,100 acres in the Weeki Wachee Preserve. HERNANDO COUNTY – The Hernando County Commission will today (April 11) consider adopting a countywide burn ban because of continuing drought conditions and the current water tower brush fire in the Weeki Wachee Preserve. If approved, this burn ban would go into effect immediately and would include any outdoor burning not regulated by the Florida Division of Forestry. The Keetch-Gyram Drought Index, designed to measure forest fire potential, ranges from 0 (very moist) to 800 (very dry). As of Monday (April 10), the current KBDI average drought index for Hernando County was 518. In a recent meeting with the local division of the Florida Forest Service and community stakeholders, it was announced that this would be a higher than average year for brush fires. Since January, Hernando County Fire Rescue has responded to 34 brush fires. Since Saturday (April 8), Hernando firefighters and state forestry officials have been fighting a blaze that began when lightning struck a muck pile near the Hernando Beach water tower. As of late Monday, about 1,100 acres had burned and the fire was about 90 percent contained. In the meantime, two other brush fires had broken out in Pasco County. Burn bans are put in place to eliminate the chance of unintentional negligence minimizing the potential of an escaping fire. For a map of active wildfires in the state, go to freshfromflorida.com. The Hernando County Commission meeting can be viewed live from the county’s website at HernandoCounty.us or on Spectrum Channel 644. The meeting begins at 9 a.m.
Photo of the Weeki Wachee wildfire courtesy of Hernando County. 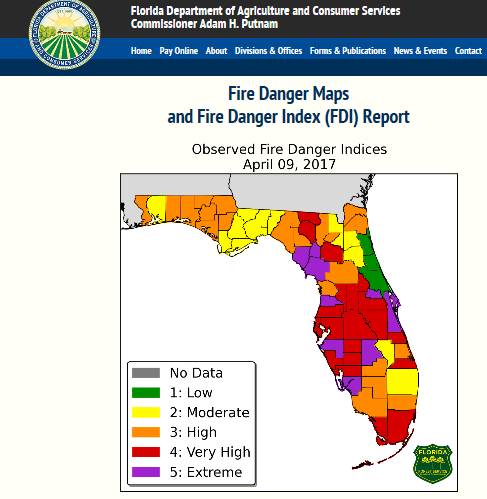 Fire danger map courtesy of the Florida Department of Agriculture.